Although Ryan Barclay has only been in his current position of director of graduate medical education (GME) at South East AHEC (SEAHEC) and New Hanover Regional Medical Center (NHRMC) for 18 months, he has made major strides in connecting GME programs across North Carolina. Thanks to Ryan and the help of other GME directors across the state, NC AHEC now has a collaborative work group intent on providing a system of great patient care to all North Carolina communities. Ryan took his idea to Dr. Joseph Pino, executive director of SEAHEC and vice president of graduate medical education at NHRMC. Pino supported Ryan’s plans and suggested he reach out to the other AHECs. Ryan started by calling Julie Michalove, GME programs administrator at Mountain AHEC (MAHEC), who was helpful and offered to share ideas. Then he spoke to another GME veteran, Terry Lynn, director of medical education at Greensboro AHEC, who offered to host the first NC GME Directors meeting in Greensboro. “After that I started contacting every GME program across the state to see if they would be interested in meeting,” continued Ryan. It turned out that a lot of other people were interested—very interested. The initial meeting was set to take place in September, and directors from all nine AHECs; from Cone Health, Atrium, Wake Forest Baptist Medical Center, Vidant, and WakeMed; from Campbell University’s School of Osteopathic Medicine, Duke University, East Carolina University, and UNC Chapel Hill, had registered to participate. Then Hurricane Florence damaged SEAHEC’s internal medicine and ob/gyn offices. Other areas of the state were hit hard, as well. Ryan had to cancel the meeting. Although it was a setback, Ryan was determined to keep the ball rolling. The meeting was rescheduled for December, which happened to occur directly after North Carolina was hit with a huge snow storm that crippled most of the state. “I honestly thought a higher power was at work against us and did not want us to get together,” Ryan laughed. But the group moved forward; those who could travel to the meeting attended, including Hugh Tilson, the new director of the NC AHEC Program, who has been instrumental in supporting the process for the team, Ryan noted. Thus, the first NC GME Directors Collaborative work group convened in Greensboro on December 12, 2018. The group now convenes monthly, and there are plans in place for a larger forum in August where designated institutional officials (DIOs), directors, and coordinators come together to create standard training programs for residents that tackle statewide issues, such as opiate addiction, underserved populations, and health equity. In just the past few months, the group has discussed ideas for faculty development, resident wellbeing, patient safety, and creating a registry of speakers and subject matter experts. Ryan is striving for continuous improvement wherever he goes. In his day to day work, he is constantly looking for ways to help improve how providers do their jobs. He provides educational resources, curricula, technology, and innovation to support them in their roles. 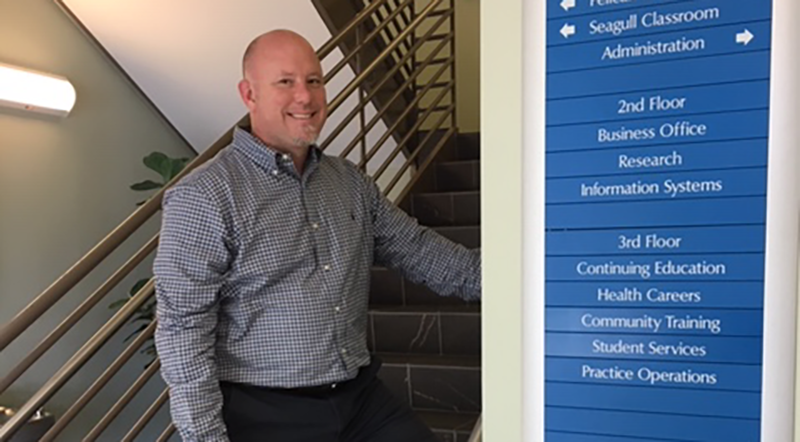 Ryan ensures SEAHEC’s residency programs meet and exceed ACGME accreditation standards, going well beyond the minimum requirements to address topics specific to NHRMC programs—such as provider wellness. SEAHEC is currently training 74 residents in internal medicine, obstetrics and gynecology, family medicine, and surgery. These residency programs are closely integrated with the community hospital at NHRMC. A big portion of the hospital’s care is provided by SEAHEC-trained residents,” said Ryan. First-year resident interns are often over-burdened and forget to take care of themselves as they transition into such a stressful atmosphere. Ryan implemented a resident wellness program that provides the new interns with targeted support specific to their needs. The program includes quarterly meetings where the interns get a wellness measure, resources the interns need to succeed, and information to help residents in a crisis. “It brings personal wellness to the forefront from a holistic standpoint,” added Ryan. This type of program is exactly the reason why a GME Directors Collaborative is needed. If the program is successful, it can be honed and shared with the GME Directors Collaborative and replicated across the state. For more information about graduate medical education at SEAHEC, visit seahec.net. To learn more about the GME Directors Collaborative, contact Ryan Barclay at ryan.barclay@nhrmc.org.